Who are the parents of the race of Centaurs? What Lapith man was once a girl? Which bird is sacred to Hera? Which statement is not true of Hephaestus? a. He worked in a forge. b. He was cast down to earth. c. His wife was the goddess of love, Aphrodite. d. Samos, the island where he landed, was the site of an important sanctuary of Hephaestus. 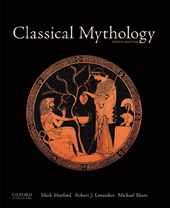 Which of the following is not a child of Zeus and Hera? Who was the prophet gifted with understanding the speech of animals? Who is the goddess of the hearth? Which cannot be considered an offspring of Zeus and Themis? What is the Roman name for the Fates? In the tale of the adultery of Ares and Aphrodite in the Odyssey, what god boasts he would endure any number of shackles to lie with Aphrodite? With what river does Hephaestus do battle in the Iliad? What is the etymological root of Zeus' name?